Firstly, you need physical NICs which support VLAN tagging and you need to enable the feature. However, you should generally not set the VLAN ID at the physical NIC, it should be set on either the Virtual Switch or the individual Virtual Machine’s configuration. The VLAN ID on the Virtual Switch is what the Host or Parent Partition uses. 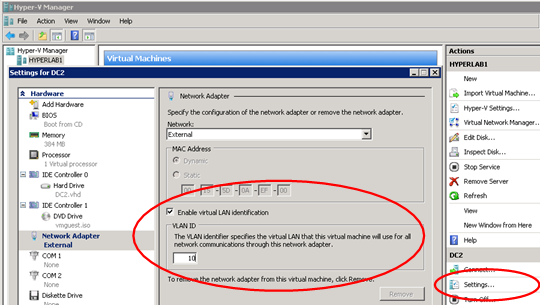 The VLAN ID setting on the individual Virtual Machine’s settings is what each VM will use. When creating an External network in Hyper-V, a virtual network switch is created and bound to the selected physical adapter. 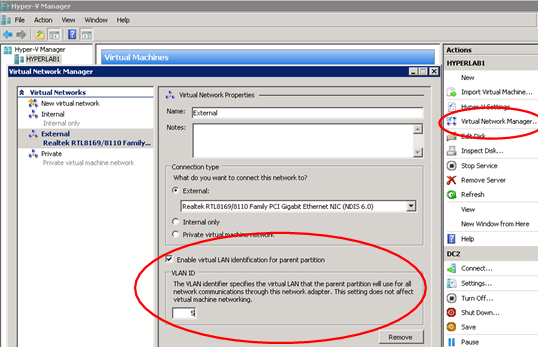 A new virtual network adapter is created in the parent partition and connected to the virtual network switch. 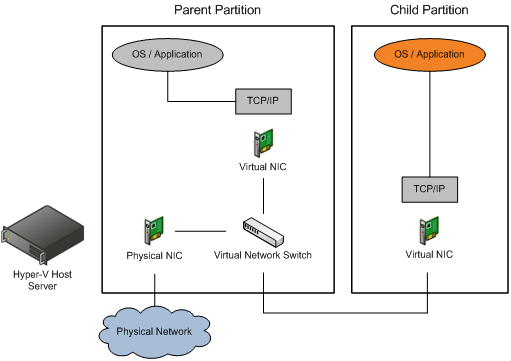 Child partitions can be bound to the virtual network switch by using virtual network adapters. The diagram below illustrates the architecture. The expected behavior is that there is a single virtual switch, the parent and two children can only talk on their respective VLANs, and they can’t talk to eachother. Do you have to explicitly account for the trunk port setting anywhere in the process, or does the fact that assigning vlan id’s at the virtual switch and in the child partition virtual nics automatically convert the physcial nic to trunk mode? On the nics we are currently using there is a place within it’s own device configuration to set it’s VLAN ID, but there is no specific place to change it from ‘access’ (single VLAN) to ‘trunk’ (multiple VLANs). Dan, definitely check with your NIC manufacturer (i.e. the user manual for the NIC). In all cases I have seen, it is not necessary to do anything other than ensure the VLAN feature is enabled on the Host (ctrl pnl, network connections, properties of NIC, configure, advanced). Do not set a network address or assign a VLAN here to use VLANs on V-Switches or VMs. Please advice on that issue and you fast response is appreciated. It sounds like your scenario should be working. Yes, it’s true you can only assign 1 VLAN ID on the Virtual Switch itself, but that does not mean the VMs cannot all be on different VLANs as well. 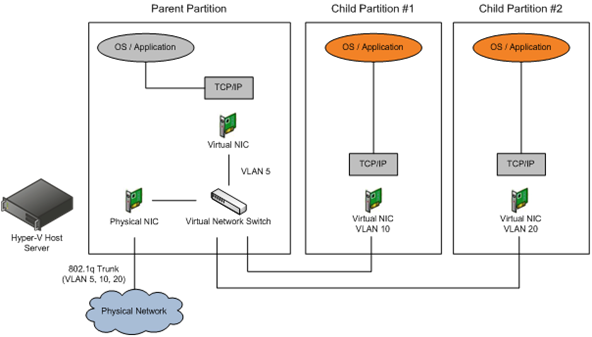 As illustrated above, the V-Switch (parent partition) can operate on one VLAN, and the VMs (child partitions) can operate on different VLANs. If it’s not working, I would typically suspect the NIC. Make sure you are using the latest drivers, VLAN is enabled on the NIC properties (set on the Hyper-V Host), and there are no known issues, such as was the case for a long time with certain Broadcom NICs. The other possible cause is the trunk is not properly configured on the physical switch that the Host’s V-Switch is using. Thanks. Nice and clearly explained.